like Jakarta, it’s motorcycle town. They rule the roads. Almost everybody goes by motorcycle. And it takes me 20-30 minutes with motorcycle taxi to go from home to the office. It takes slightly longer to ride a taxi to the office. Why? Because the traffic lights are frequent and short-timed, and everybody obeys the speed limit. Yeah, everybody. Of course, it’s cheaper by motorcycle taxi. Just like Jakarta, it’s tough to find available cabs when it’s raining, and sometimes it floods. But [so far], there have never been any mind-boggling traffic jam-inducing floods. I still can get home, even at rush hour, within 30 minutes. The air is clearer here and there’s still a fog at 8 AM (when I leave for work). My office’s office hours are 8.30 AM to 5.30 PM, but of course the hours are relatively flexible. Almost every cafe and restaurant has free, fast WiFi. Even so, most Vietnamese settle for their version of “warung kopi” on the street side, with very short chairs and tables. Even when there’s a flood. Oh, the definition of flood here is perhaps ankle deep, and usually subsides quickly. The Vietnamese language has a phonetic system, where one word can have different meanings if pronounced differently. Try giving directions with the wrong pronunciation, and the taxi driver will just look at you with a confused look or laugh. But they will appreciate foreigners who put effort in learning the language, even if only a bit. The internet industry is somewhat on par, if not more advanced compared to Indonesia (at least in some sectors). Groupon-type businesses generate real money and traffic, and there is a local site called Diadiem.com which is a directory and maps service, complete with 3D view – so complete, that Google buys data from them. Mobile internet is still in its infancy. It’s definitely not Blackberry country. Signing up for BB service costs you around USD 150 just to register, and USD 25 for monthly service (and you have to deposit 6 months upfront). On the other hand, standard GPRS data packages are cheap and people generally use Nokias and iPhones. Did I say the food is great? So far, I love it here. The work I am doing is tiring but worthwhile, and at least I don’t tire myself out going to and from the office. My current company believes that Indonesians are good workers and bring a lot of value (there are at least 4 Indonesians in the various branches of my company), and I hope to maintain that belief. I am also hoping that many more Indonesians can work overseas also, at least for part of their lives. Perhaps we’re not on the ground at home helping to build the nation, but we are working in the midst of various nations showing the quality of work and life that Indonesians have to offer. That, I think, is also a patriotic duty and I hope I can fulfill mine well. 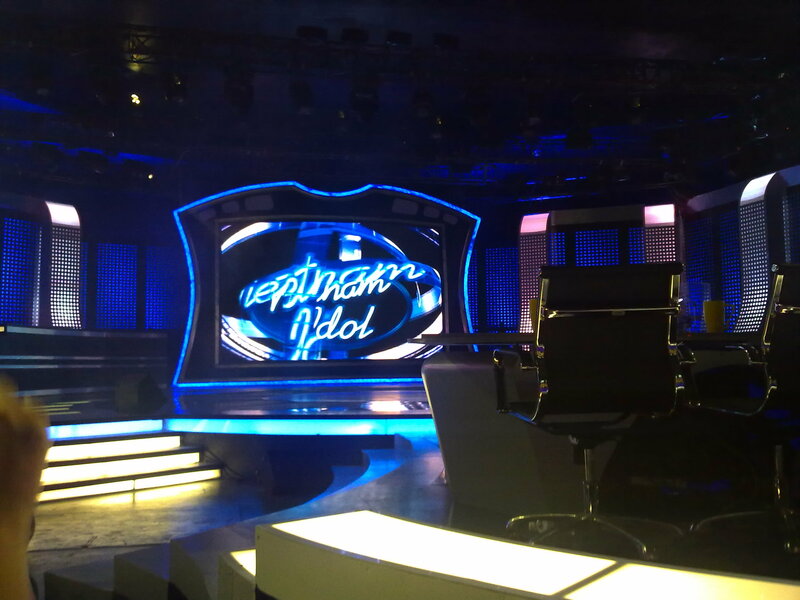 Yeah, I Came And Watched Vietnam Idol, Live. Needless to say, we didn’t understand a word of it. But it was certainly a fun night, with interesting burgers and fries to boot. Hey, here’s some of the pictures of our apartement in Ho Chi Minh City.